After reading Jo’s second gorgeous novel, Hand of Isis, I knew I had to get her on the blog again for another interview, and not only did Jo agree and answer the questions I had, she also gave me some great news to post here – the first public announcement of a new project! 🙂 I’ll bold it, of course, so that you don’t miss it! It feels wonderful! I’m delighted to be able to write full time right now. I’m already working on the next Numinous World book, tentatively called Lioness. It’s about a Persian princess in the 6th century BC, the daughter of Darius the Great. It couldn’t have all been a walk in the park – how do you deal with life while having to remain focused on your writing? My partner, Amy, is a saint! She’s wonderful when I have deadlines, and she puts up with months of conversation about the most obscure things. Now that you have two much-loved and acclaimed novels out in the world, has your life changed markedly since Black Ships or has it been much of the same? As I said, it’s wonderful to be able to write full time. And unsurprisingly I’m getting much more done! Let’s talk about Gull and Charmian – can you take us behind the scenes (without spoiling those who haven’t yet read Hand of Isis) and talk about the creation and evolution of these wonderful characters? Both of them are explorations of different archetypes that aren’t very common in fiction, especially fiction about women. Gull is a priestess, and while heroic fantasy has plenty of young warrior maidens, the priestess has been largely overlooked in recent years. You really have to go back to Marion Zimmer Bradley, Diana Paxson and Judith Tarr to find her. Gull puts her vocation first. It’s more important than any person in her life, more important than anything else in her life. We don’t talk about religious devotion very well in our society, so it’s very gratifying to me to hear from readers, from a female rabbinical student, from a woman minister in the Midwestern US, from a female Church of England divinity student, that they see their experiences reflected in Gull. Charmian is a different archetype. She’s Isis Pelagia, not Isis the Lady of Amenti, the Queen of Love. And as such, she doesn’t belong to any man, doesn’t commit to any lover. She belongs to herself, and shares herself where she chooses. And yet it’s not selfish. Charmian is honest, and she’s not playing games or “working through issues.” It’s who she is. And she doesn’t know one end of a weapon from the other! She’s not a warrior maiden, and we have very ambivalent feelings about a woman like her in our society. They’ve both been fascinating to write, the same person embodying two entirely different archetypes. In Stealing Fire we’ll see her as a man, Lydias, a soldier and adventurer. You told me a while ago that you wanted your Cleopatra to be as close to the historical Cleopatra as possible and not to let your own opinions of her influence her characterization – was this difficult to do? Very difficult! Almost everything we know about Cleopatra comes from her enemies. We don’t have contemporary Egyptian sources, so it’s very challenging to reconstruct. Comparing Hand of Isis to Black Ships, your talents for world-building and characterization have really blossomed, and you’ve really built upon the work done in Black Ships and made Hand of Isis a bigger, more beautiful book: were there any specific areas you wanted to improve upon? Thank you! I’m glad you think so. It’s a much longer book, and I think a lot of the difference is the depth of the world building. So…more space! The characters that share Charmian’s tale are all unique in their own right, able to carry a novel on their own – how difficult was it to keep them fresh and engaging without making them echoes of the supporting cast from Black Ships? Well, the echoes go forward and back! Many of them are meant to be the same characters, but they don’t present the same way each time. They are echoes of each other, and of the characters from other stories that aren’t told yet. But I think their life stories, what happens to them, makes them distinct. For example, Dion and Ashterah aren’t by any means the same person! What are you feelings on the recently unveiled new over art for the re-print of Black Ships? Is that your Gull, or as close as it could be? It’s gorgeous! That’s definitely my Gull! Are there any plans to give your novels a ‘series’ title? Maybe something like The Saga of the Companions? 😉 Or would you like each novel to stand on its own? I’ve been calling it The Numinous World. But the question of a series title is really up to my publisher. How is Stealing Fire progressing and are you able to give us a sneak peek at what we can expect? Stealing Fire is finished! It’s strange with the publication delay to wait so long for you to see it after I finish it. Stealing Fire was done in December! Since then I’ve written an entire other book, which is not currently sold so I can’t say when you might get it, a Numinous World book called The Chariot set in 1805. I’ve also started on Lioness and on Death Game. So finishing Stealing Fire seems like it happened a long time ago to me! Sneak peak: Alexander the Great has died in Babylon, leaving the ashes of his empire to his quarrelling generals and his unborn son. Lydias of Miletus is a Companion Cavalryman, a soldier in Alexander’s service. As chaos reigns and the generals start to kill one another, General Ptolemy trusts Lydias with a charge of incredible personal importance, to get his longtime lover, the hetaira Thais, and their two young children out of Babylon and safely away from the bloodbath. Fleeing Babylon for the loyal fortress of Pelousion, Lydias is dragged into a deadly game — not just between generals and Companions, but between gods. And finally, what would you like to explore further down the road? Any other genres you’d like to dabble in? I’m looking forward to the challenge of the Stargate Atlantis novel. As a long time fanfic writer, it’s wonderful to be paid to write fanfic! I hope it will be a pleasure both to Stargate Atlantis viewers and to Jo Graham readers. First off, it’s wonderful to have this opportunity to interview you, Jo; welcome to the South African historical/fantasy-reading public! J Will you please tell us a bit about yourself – who you are, your influences and loves (both in the world of books and outside of it)? I’m sure it’s no surprise that one of my greatest influences is Cape Town writer Mary Renault! If I could give my left arm to have written one book, it would be Mary Renault’s The Persian Boy. I would say that she’s a major influence both in choice of material and in the presentation. In The Persian Boy she also uses a first person narrator, and that is one of the things that gives tremendous immediacy to events and cultures long gone. This is also true of her The Mask of Apollo and The Last of the Wine, two other books I would consider tremendous influences. Her writing is endlessly graceful, but you can see the swift flow of muscle beneath the prose. Another influence would be James Mitchener’s Tales of the South Pacific. While most people today know it as the musical South Pacific, the novel it’s based on is quite different, much more serious. And like Mary Renault, he’s taking the reader to a place not so far removed in time, but so different from the experience of most readers that it seems strange and uncharted territory. That’s the kind of journey I’d like to take readers on — to step into a life very different from their own and wear someone else’s skin. What led you to write Black Ships, and can you tell us a bit about the journey of starting the novel through to getting it published? 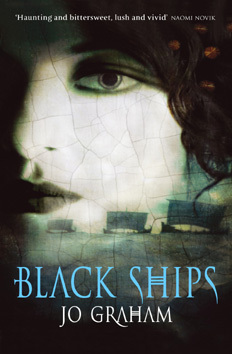 I started writing Black Ships purely for my own enjoyment, and started posting it in bits on the internet for my friends all over the world, who were reading it as a serial. One of them was the friend of a literary agent, and she showed it to the agent who sold it. It was actually entirely unexpected! Actually, I never found it difficult to stay in Gull’s head. What I found hard was to find the language to express what was there in terms that a modern person would understand. Gull doesn’t have the vocabulary to put things in our terms. For example, how to explain the crashing disasters at the end of the Bronze Age without words like economics, ecology, plate tectonics, technological change? Those words don’t even exist — they’re the product of the Classical world that comes after, the world of the rise of states after this period of disaster. So part of the challenge is to show the events without using any of the words a modern reader would use to describe them! When you set out to write Gull’s story, did you know exactly where you would be going and who would survive the journey? Yes. I knew how it would end. One of the first things I wrote in my head was the last chapter and epilogue. I knew what would happen. But I still cried buckets when I wrote the end! In fact, I can’t read it now without tearing up! We’ve had writers such as Manfredi, Iggulden, Jaques, Pressfield (to name a few) and now yourself writing the stories and legends of ancient cultures and peoples, and many of these books are incredibly popular: to what to you attribute this burgeoning interest in historical novels? We’re looking for heroes, actual heroes, people who choose to do hard things because they’re right. That’s one of the main points of Black Ships, I think. Neas and Xandros and Gull are heroes because they try to do what’s right even when it’s very difficult for them. Sometimes that’s big things, and sometimes it’s small. One of the critical decisions for Gull is her reaction to seeing Xandros and Ashterah in Byblos. She thinks about it. She could pitch a fit, she could sulk, she could punish him for being interested in someone besides her, she could sour the friendship and the working relationship they have out of jealousy. Or she could choose not to. Her choice to conduct herself in this small personal way with dignity and integrity is a major turning point of the book. If she had been jealous and angry, everything from then on built on the trust between Neas, Xandros and Gull would have been impossible. Being a hero is not only about saving the world — it’s about taking personal responsibility for your actions and not giving in to your worse nature. Other than Xandros’ cooking J is there anything else (or many things) that you wish you could have experienced from that Age? I would love to sail on a ship of that era. In nice weather! And I would love to see Egypt in that period. How did you approach getting the research you did for Black Ships done? A little at a time. There was a great deal of it, and some of it got very complicated. One of the hardest things is that the native language of the Wilusans is not Greek — it’s Arzawan, which is a very dead language that comes down to us mainly through place and personal names, and a little bit from the Hittite archives. I think the Arzawan was the biggest challenge. But in some ways, the research for Black Ships was far easier than for my next book, due out next March. That book is Hand of Isis, which is about the court of Cleopatra and the end of Ptolemaic Egypt. If the challenge in Black Ships was that too little was known, the challenge for Hand of Isis is that too much is known! In Black Ships I had a certain latitude to make something up when there simply weren’t any known facts. That was not true of Hand of Isis. Out of all the characters, would you be able to choose one that you loved writing more than the others? I love writing Gull, and I’m going to keep writing her. In Black Ships, Gull almost-kind-of remembers her lives before, in a Minoan palace before the eruption of Santorini, and in Egypt. Gull has been some interesting places, and the soul that is her has a lot more to go. Her next stop is Ptolemaic Egypt, but it’s only the first stop on a long and interesting trip! The UK cover for Black Ships is very striking – were you able to have any input in the creative process behind getting the cover done? Yes, and I was incredibly pleased with the result. I think they did a wonderful job! I particularly like that you can see the copper hair pins. Everybody’s probably read it, but if you liked Black Ships I recommend Marion Zimmer Bradley’s The Mists of Avalon. I also always follow Judith Tarr. Her Lord of the Two Lands is my favourite of hers. Finally, what is next for you (and us)? Will you be carrying on with Gull’s story or will you embark on a new journey? I’m carrying on with Gull, but in a new body and with a new face! Gull loved Egypt, and perhaps her greatest regret was that she could not stay. Gull has returned to Egypt in the last days of the Ptolemies before Caesar comes to Alexandria as Charmian, the half-sister of Cleopatra by one of the palace slave women. She may not remember all she has done before, but she is always and forever an oracle. Hand of Isis will be out in March, and I hope you enjoy it! I’ll be putting updates and perhaps some excerpts on my livejournal, www.livejournal.com/users/jo_graham. There’s also more info about Black Ships there, and I am always happy to answer reader questions. Yesterday evening I finished Black Ships. I had been reading it in the bath, so I set the book aside and lay back, thinking about what had just ended. Guys, if you see this book on a bookstore’s shelf, buy it and read it and get lost in it; I did, and I now know that I’ve read a book that’ll always stay with me. Let me quickly put this into perspective for you: I primarily read Epic Fantasy and Hard SF (many other genres inbetween but the two above are my great loves), and I had read David Anthony Durham’s Acacia before Black Ships; you see, since I had an idea what to expect from Jo’s book, I knew that I wasn’t going to be reading Epic Fantasy, so I didn’t expect anything like that from Black Ships. Black Ships is a beautiful read, absolutely and without doubt, beautiful! Jo’s economy and elegance with words completely pulls you in – she tells the story with exactly the right amount of detail, thereby painting her landscapes and characters in effortless strokes. You never have one of the moments where you think, ‘Huh? What’s that?’ and then have to go back and re-read a section. You also never have to skip a section – Jo never bored me, and every word that slipped in through my eyes stayed there. There were never any words that seemed out of place or wrong, where as soon as you read them, you think, ‘Okay, I wouldn’t have used that word or so many words to explain that or this.’ and her narrative style is so easy on the eyes and brain that before you know it, you’ve finished the first 100 pages and it doesn’t matter that you missed your favourite TV show or that it’s half-past 3 in the morning; but don’t misunderstand me either – I could put this book down and go do something else, but the fact that I’m trying to articulate here is that Black Ships was always in my mind. I never stopped thinking about the book or the characters or the world that Jo Graham shows us. Aren’t I a lucky guy? If I don’t post an update again this weekend, I hope you all have a wonderful relaxing weekend, and I hope you’re buying and reading! Today was a very good day! I emailed around seven or eight authors today (trying to set up interviews), and got three replies; one from an email that I sent last week, and two from emails I sent today. The third reply came from Shawn Speakman, and if you don’t know who that is, go check out www.terrybrooks.net; Shawn’s the head honcho there, and a published author in his own right. I posted a question on the ‘Ask Terry’ portion of the site, querying the possibility of an interview with Terry Brooks, and Shawn replied and laid out for me what I need to do, so hold thumbs for that! Other news: I’ve queried a few authors for interviews, not all of which will be posted on this blog (some authors write in genres other than SF & Fantasy), but as soon as I’ve got confirmation of the interviews (and the reviews (if any) that precede them) I’ll let you all know here. Suffice it to say that things are picking up speed here folks!